Palmetto Road waterproof flooring is a luxury vinyl product with a dense extruded waterproof core (no wood) giving it a unique balance of resilience and rigidity. It has a strong, protective ceramic bead top wear layer that easily resists scratches, dents and stains. It is 100% waterproof and will not swell or delaminate when exposed to water making it safe to install in bathrooms, basements and kitchens. What safety and environmental requirements does Palmetto Road waterproof flooring meet? Palmetto Road waterproof flooring is FloorScore® certified and has been tested for CARB II compliance (non-detectable readings). Palmetto Road uses safe, non ortho-phthalate plasticizers in all of its vinyl flooring products. What does FloorScore® certification mean to you? FloorScore is a voluntary, independent certification program that tests and certifies hard surface flooring and the materials they’re made with are in compliance with stringent indoor air quality emissions. The FloorScore program was developed by the Resilient Floor Covering Institute and is certified by a nationally recognized third-party certification company. Basically, the FloorScore certification means healthier, cleaner air inside your home. What is the difference between the Tidewater and Barrier 20 Collections? Palmetto Road offers two waterproof flooring collections, Tidewater and Barrier 20. Both collections are FloorScore certified, waterproof, durable, easy to maintain, warm underfoot, and feature the Unilin locking system on all sides. The Tidewater Collection is recommended for residential and light commercial use. It has a 12mil urethane wear layer, 2mm 100% virgin vinyl plank and a 5mm extruded waterproof core. 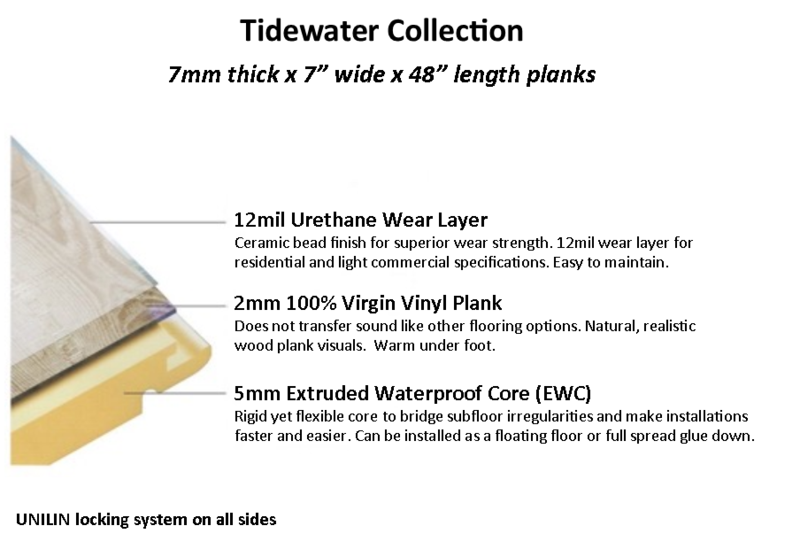 The Tidewater Collection offers a lifetime residential warranty and a 5 year light commercial warranty. 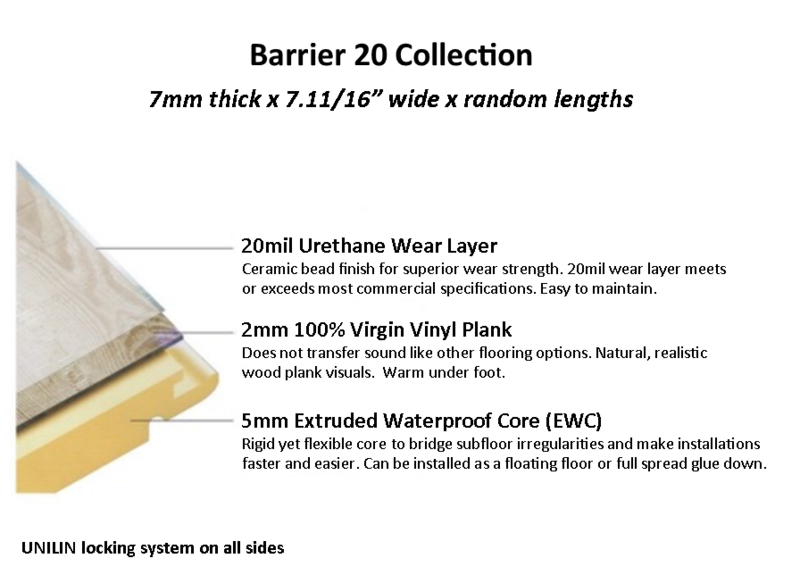 Barrier 20 is intended for commercial applications with its heavy 20 mil urethane wear layer, 2 mm 100% virgin vinyl plank and a 5mm extruded waterproof core. The planks are enhanced by cut and painted beveled edges on all four sides. Barrier 20 offers a lifetime residential and 15 commercial warranty. How is Palmetto Road waterproof flooring installed? Palmetto Road waterproof collections can be installed as a floating floor or full spread glue down. Both collections are waterproof and do not have to be acclimated for moisture. However, they do need to be acclimated for temperature.  Install with planks mixed out of multiple boxes to achieve the mix of color that has been built into the product.  The planks can be glued down as needed.  Use a tapping block to ensure the joint is completely “seated” or engaged when clicked together. It is recommended to use the Palmetto Road tapping blocks to ensure proper installation. Note: Different tapping blocks are needed for Tidewater and Barrier 20 installations. Contact your Palmetto Road flooring retailer for more information. For complete information, please see the installation instructions. Is underlayment needed with Palmetto Road waterproof flooring? It is not necessary to use underlayment when installing Palmetto Road waterproof flooring. However, if underlayment is used, Palmetto Road only recommends Silencio Solutions RY1010 underlayment for warranty purposes. Palmetto Road waterproof flooring has been tested on concrete slab with Silencio Solutions underlayment and achieved an IIC rating 62. Silencio Solutions RY1010 is available through Palmetto Road flooring retailers. What does the waterproof flooring warranty cover?